Today on the YarnThing Podcast with Marly Bird: the owners of Webs America’s Yarn Store, Kathy and Steve Elkins! Kathy learned to crochet, along with several other crafts, when she was small from one of her neighbors, an older German lady. She tried to learned to knit around the same time, but it just didn’t really click until much later in life. Kathy can knit, but as she said, most of her staff could knit her into a corner and she might not be able to frog herself out ;). Steve doesn’t knit or crochet but he can weave. His parents founded Webs originally as a weaving store so knitting and crochet were not a large part of their business. Kathy and Steve met when they were both sales analysts for a Budweiser distributor. While they had a bit of friction at the beginning, they eventually found themselves in love. After moving around several companies in the New England area, Steve was going to be moved again but not to anyplace that really appealed to both of them. Steve’s parents were ready to move on from the store and asked them one last time if they would like to take over for them. After talking it over, Kathy and Steve decided to do it. A few particulars about the business. 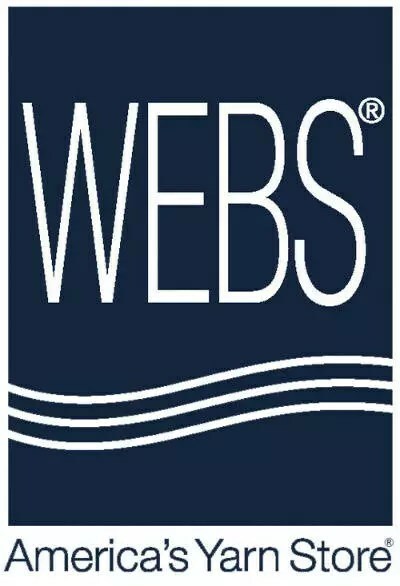 Webs was founded in 1974 by Steve’s mother Barbara Elkins and her business partner, Donna Muller. Originally based out of their basement, they moved to a store front several years later and Donna sold her share to Barbara. Soon after Steve’s father retired from being a professor at UMass and joined his wife in the business. After moving house several times, they ended up in their current location in Northampton Massachusetts in 1992. Steve and Kathy took over 10 years later and they are still going strong! They offer both their own line of yarns, Valley Yarns, as well as all of the big yarn lines in the knitting, crochet, and weaving industries. Their brick and mortar store in Northampton offers a LYS experience in the front, with most of the yarns they sell displayed, and they also have the warehouse area in the back where they have their inventory. One of their big draw points is their bulk discount. If you order/buy enough in yarn and books, they will automatically give a percentage discount based on your original total, 20% off if you spend at least $6o and 25% off if you spend over $120! Hope this has piqued your interest to hear more about Webs and everything going on with Kathy and Steve. Listen in below to hear all the details about their blog, podcast and Stitches events! Not only does Webs love Marly but we do too! Thank you for a great show as usual! I get to Webs about every other month and LOVE them so I am glad to hear that Web’s loves Marly. This was a great interview, I listen to Ready Set Knit too and love Kathy. Having two such great interviewers talking together made a great show. Thanks again Marly, another one to bookmark. Web’s loves Marly especially when she wears her llama pj’s. I live near Web’s so shop often. I am able to visit Webs about twice a year. I love the store and I always learn so much every time I go to Webs. I bet Webs loves Marly, too. WEBS loves Marly, and I love both Marly and WEBS. I visit WEBS twice a year and am always amazed at how a store so large can provide the excellent service they do even when a large group, like the busload of my local knitting guild, when we descend on them. Well, if WEBS loves Marly, then she must be top notch! I am sure Marly loves WEBS as much as WEBS loves Marly! I love WEBS toooooo!!!!!!!! Hope this counts! btw, Elkins, do you by chance have relatives in Oregon? My child’s class mates has the same name…. Webs loves Marly because, well, who wouldn’t? I just recently discovered WEBS and their site is great! It seems like WEBS loves Marly which is totally justified 🙂 Hope I can visit WEBS sometime or maybe see them at Stitches South! I Love WEBS, and I love Marly so therefore WEBS loves Marly. The new spring catalog is gorgeous! WEBS loves Marly, and I’m sure Marly loves WEBS. Great interview. WEBS loves Marly and so do I!! I love Marly’s podcast and I am glad to hear that WEBS loves Marly too. I always love to see what WEBs brings to Stitches Midwest and can only dream of what the retail/wharehouse looks like. Shopping online is fun, but to see and feel is even better. It’s on my list to visit one day =) I am a Machine Knitter (as well as hand Knitter and Crocheter) and their selection of coned yarn is very much appreciated. WEBS loves Marly…and I love them both! Come to think of it…..who doesn’t?? webs loves Marly just as much as all of her loyal fans! Thanks for another great show! Fun podcast. Webs is a great asset to the knitting community. Webs loves Marly! I am glad WEBS loves Marly! This was such an interesting interview! Loved learning about the history of Webs! Thanks for having the Elkins’ on your show, Marly. It was clear how much WEBS loves Marly! I hope you get a chance to get to Webs Marly since Webs loves Marly. I hope to get there some day myself. Wonderful interview. I always love hearing the stories of how people made it to the industry. So much yarn love–Webs loves Marly, Marly loves Webs, and we all love both Marly and Webs. I hope to visit Webs in person some day, but for now I just spend lots of my yarn dollars on their web site. I really love listening to both the Yarn Thing Podcast and Ready, Set, Knit. Although I have to admit, both podcasts always tantalize me with new projects, yarn, and tools, and my pocketbook always ends up a little lighter at the end of these podcasts…..
No wonder WEBS loves Marly…when I visited WEBS in person I told another fellow shopper that “I was in a yarn coma” (in a good way LOL). Loved my visit there and loved hearing the story behind this great enterprise! Of course WEBS loves Marly! Everyone loves Marl!! That was a great podcast, Marly. I really enjoyed learning more about WEBS. I have been listening to their podcast for a couple of years and just found yours. I can see why webs loves Marly because you really enjoy your guests. I so enjoyed listening to this podcast, I now have a new place to get yarn. ^_^ I know why WEBS loves Marly, because so do I! Webs love Marly but doesn’t everyone! How lucky was I to get back to listening to the podcast when WEBS was there to visit! Not only does WEBS love Marly! I’ve missed my Marly fix! So glad to have caught this podcast…. I love Marly and am so excited to hear the Webs loves Marly, too. Going to Webs is a mind blowing experience, but it makes your head hurt in a good way. So much yarn to see and touch. Loved the podcast. I listen to Ready Set Knit every week, in addition to Marly’s podcast. I will certainly remember that WEBs loves Marly! I’m a big follower of both Ready Set Knit and the YarnThing podcast. Both entertain and educate. Best of all I love how you all support each other, always cheering for each other successes. What a wonderful industry to be a part of. That is what made it seem so right when Kathy said WEBS loves Marly. It truly made me smile. Great podcast this week and of course Webs loves Marly as she is so bubbly. Web’s loves Marly, as do all her podcast listeners! I just adore Kathy and Steve. Webs is one of my favorite places to shop via the web. WEBS loves Marly, and I think she loves them right back! Just discovered the podcast! It was great to hear how WEBS came to be and how much WEBS loves Marly! Another interesting show, Marly! It’s fun to get the backgrounds of your guests and how they got started in their businesses. It’s so inspiring, too! And, of course, WEBS loves Marly — we all do! Great job, Marly! Love your show Marly! I just now visited WEBS online store and I just loved it. I am going to have to have alot of self-control there. I heard that WEBS loves Marly and so do I. Thanks for a great interview. Webs Loves Marly and we Love Webs ….. all this knitting love is rhyming in my head. It makes me want to sing, it makes me want to dance …. it makes me want to go on a knitting Rant! I can’t go a few months without placing an order with WEBS. I love WEBS and I love Marly, so not surprised that WEBS loves Marly! WEBS loves Marly. I love Webs. I love Marly and I love Steve and Kathy!! From this podcast, it is clear WEBS loves Marly! As always, a great podcast! WEBS loves Marly, and so does Teaneck NJ! Great podcast! It was great to hear that WEBS loves marly too! Webs loves Marly like I love Marly. I enjoy listening to both Marly Bird and Ready Set Knit. Webs loves Marly and I loved listening to them both on the podcast. I’ve heard of Webs, but not the back story about Webs, nor that it is a live LYS. I just knew the name from the Internet. I will have to go looking now. I bet Webs Loves Marley!